The first mention of an olive in Scripture is found in Genesis 8 in the story of Noah. In the video lesson, Margaret Feinberg taught that God could have sent any leaf, by way of the dove, but chose to have the dove deliver an olive leaf. Both, the leaf and the dove, become symbols of peace. She writes in the Taste and See companion book that “[i]n that moment, God hand-delivers pax on pax, shalom on shalom, peace on peace, giving us hope that in the painful storms of life, God will heal us with his deep peace, too.” She also suggests that God’s peace was already planted there. This week in our lessons we learned about the resilience of the olive tree and some of its healing properties. In our lesson on Day One, we studied and answered questions about the use of oil as a symbol of the healing work of the Spirit. We contemplated areas of our lives that needed God’s healing touch. The lesson on Day Two instructed us to read chapter seven of the companion book. 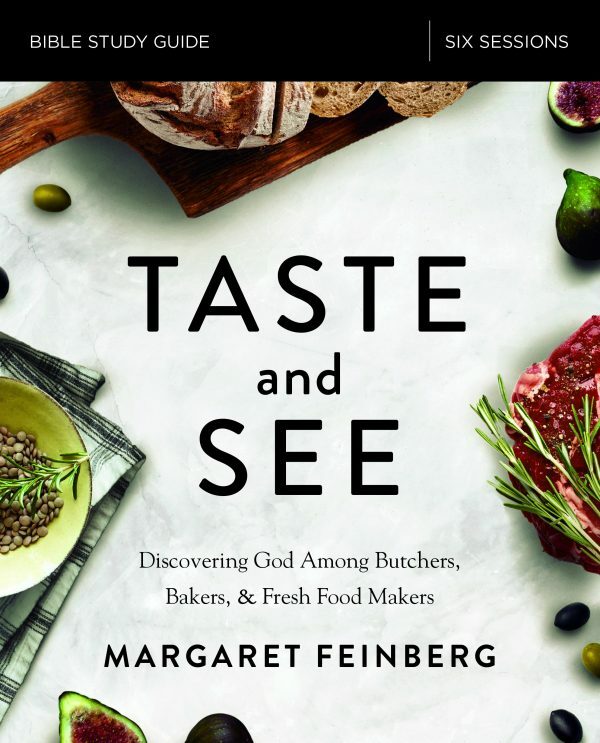 We answered questions regarding Margaret Feinberg’s time spent with a butcher who helps others understand where their food is coming from and to help people connect through food. We also gained valuable insight about livestock in the ancient world. We also considered the depth of Christ’s sacrifice. By taking on flesh, He not only sympathized with our pain but was able to empathize with us as well. Jesus doesn’t run from our pain or our desperate need. Instead, He enters into our pain by understanding, rescuing, and alleviating it. Our lesson on Day Three took us into an olive grove to consider the olive tree’s resiliency and how that same resilience can be applied to our spiritual lives. We considered the above passage from Job and the principle of Jesus Christ renewing the sprig of life within us. On Day Four, our lesson directed us to read chapter eight of the companion book. We then answered questions based on our reading about Margaret Feinberg’s description of the Passover meal. In this lesson, we also chose one or more of the following intentional activities. Our choices were to infuse our olive oil with herbs or spices, to invite a person new to the area or someone who may be on the margins to have coffee or the sharing of a meal, to pray over our home and anoint each doorpost with a dab of olive oil symbolizing the consecration of our home as holy and pure or to select and read three healing stories of Jesus from the Gospels and answer the questions listed in the workbook. For Session Five, we did not have a lesson for Day Five. The weekly lessons for this study concluded with Session Five Day Four. A video lesson and questions are contained in the study guide for Session Six entitled “Discovering the Liturgy of the Table.” I will provide a wrap up to this study next week.